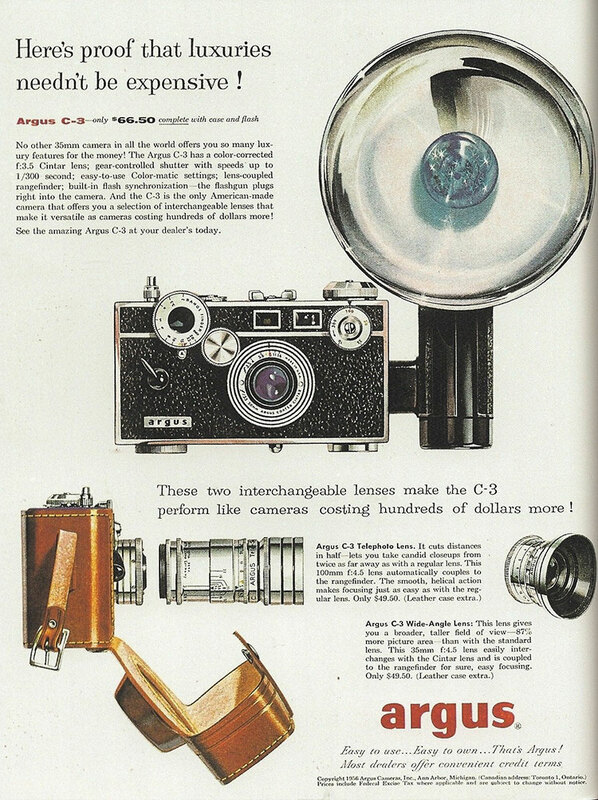 A best-selling camera for nearly three decades, the Argus C-series was first introduced in 1939. It was a low-priced rangefinder–as shown in the ad below, the body cost just $66.50 in 1956. The C-series helped popularize the 35mm format, which became the most common format until digital cameras became ultra-popular in the mid- to late-1990s. Granted, $66.50 in 1956 would be more than $550 today, but for those serious about preserving memories, the Argus C-3 was the most serious camera in that price range. It came with a case and flash, and alternate lenses were available for $49.50 each. What’s even more interesting about this camera is the materials used. The C-3 was made primarily of Bakelite, with metal casings. It was a heavy camera, often referred to as “the brick”. It was also simple design and construction, which made it easy to repair, even today. The Argus C-3 was used for many popular photos, including those taken by US soldier and photojournalist Tony Vaccaro during WWII. Rumor has it he developed some of his film in soldier’s helmet. Those wanting to display (or use) an Argus C-3 for nostalgic purposes are in luck. While these cameras are considered collectible, they can be found rather inexpensively on auction sites. Many of the camera bodies can be had for around $30. Not much to pay for a real part of American history.